Delightful, stylish holiday accommodation in a peaceful location of outstanding natural beauty, near the Hampshire/Wiltshire border. One master bedroom sleeps 2 (4 possible) with ensuite bathroom with shower and bath, with two additional pull-out beds downstairs if required to accommodate a maximum of 6 people. Downstairs an open plan lounge and kitchen-diner. The property is in the grounds of our family home with its own private outdoor seating area, a lounge terrace with hammocks, BBQ, and access to the spacious garden with swings and a trampoline. The property is within walking distance of an excellent local pub serving good food, with additional great food pubs a 5 or 10 minute drive away. Stunning walks on the doorstep with an extensive network of footpaths and bridleways, ideal for walkers and birdwatchers. Superb bluebell woods within walking distance from the house. Excellent mountain biking opportunities, with easy access to off-road trails. For good road biking, National Cycle route 24 runs from Andover to Romsey along the Test Way, Route 246 and 4 from Andover to Newbury along beautiful Hampshire and Berkshire country lanes. A short drive to some outstanding local chalk-stream fly fishing. Free flood-lit tennis court 2 minutes drive. A 20 minute drive to the World Heritage site of Stonehenge, and also Avebury and Danebury Ring, and a 30 minute drive to the cathedral towns of Winchester and Salisbury. The market towns of Andover and Newbury are a 7 and 20 minute driver, respectively. The village of Highclere with the famous Highclere Castle (Downton Abbey fame) is a 20 minute drive from the house. Approximately 20 minute drive to the famous 'Bombay Saphire' gin distillery, with guided tours and cocktail courses available. The distillery is next door to the equally famous Watership Down pub (setting for the Watership Down book), a beautiful location for a delicious meal, and also walking distance to 'Hardy's' plants, with horticultural courses available on propagation, and rare plants for your garden. Local farm shops within 10 minutes drive, selling excellent, locally sourced produce, with sausage-making courses available. Direct train line from Andover to London Waterloo (1 hour 5 minutes) with easy access to the cultural highlights of the city. Chickens, cats and a quiet, lovable golden retriever dog (Carly) also on site, and horses next door. 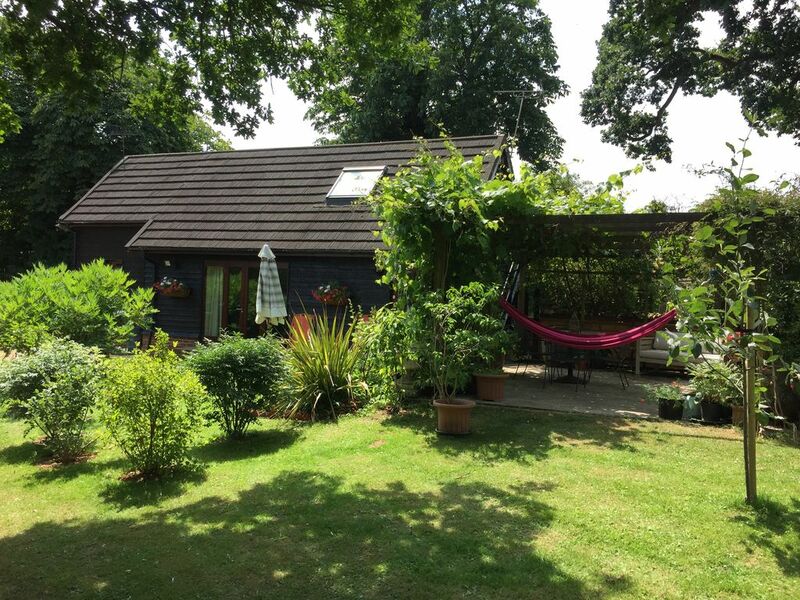 Rob and Maggie decided to buy Oakcroft and Oakcroft Annexe in 2011 to enjoy the countryside delights rural North Hampshire has to offer with their two teenage daughters, Ana and Jessica. Chickens, cats and Carly the dog soon followed to add to the fun. Fishing, cycling, tennis, running, walking and growing your own fruit and vegetables keep us busy when there's free time away from work or school. The property is a fantastic, private, stylish accommodation in a beautiful, quiet, rural setting ideally placed for walking, biking, fishing and bird watching. There are spectacular views across rolling countryside mixed with beautiful woodlands and bluebells in early summer just a short distance from the property. It's a delightful spot to use as a base from which to visit the many historical cities and towns nearby such as Winchester (King Arthur's Round Table), Salisbury (Old Sarum, Salisbury Cathedral), Newbury (unique Watermill Theatre), Hungerford (antiques centre), Southampton (West Quay shopping and Southampton Docks), Portsmouth (HMS Victory and the Mary Rose), and Bath (Roman baths and great shopping) as well as the World Heritage site of Stonehenge, Avebury and Danebury Iron Age Hillfort. There is also an excellent Iron Age Museum in Andover displaying many of the iron-age finds from the Hillfort. The village of Highclere is nearby, with the stunning Highclere Castle (of Downton Abbey fame). Twenty minutes drive away is the gin distillery 'Bombay Saphire', providing gin tours, tasting and cocktails, as well as cocktail-making courses. The distillery is next door to the Watership Down pub (famous from the Richard Adam's book, 'Watership Down'), offering a lovely rural setting for a quiet drink and delicious meals. It's also close to Hardy's Cottage Garden Plants, one of the UK's leading plantsmen nurseries, with courses available in propagation and border planting as well as being stocked with over 1200 varieties of rare plants There are several excellent local pubs for food within 5 miles of the property, one of which is within easy walking distance. We are also very close to two super farm shops, offering a selection of locally produced, high quality meat and home-made produce, with sausage-making courses available. A free community tennis court, with floodlights and online booking facility, is available next to the village hall in Wildhern, 2 miles from the property. Andover Golf Club has a delightful 9-hole course in Andover (15 minute drive) and The Hampshire Golf Club has a full 18 hole course (20 minute drive). There is a croquet set, badminton rackets, table tennis table, trampoline and swings available for the children. Children's car seats also available. The perfect setting. Amazing and friendly hosts. Clean, cozy & quiet retreat! We cannot say enough good things about Oakcroft! My husband, 2 daughters and I stayed here for over 3 weeks and it was a home away from home. The owners, Maggie and Rob, are super friendly and welcoming and the property is well cared for, stylish and very clean. The kitchen was very well appointed and loved the extra touches... fresh eggs, homemade jam and wine when we first arrived. The garden space is lovely and our girls enjoyed the space to run around and play in an enclosed space. Great pub with excellent food within walking distance as well as beautiful walking trail. Lots of great recommendations for places to eat and explore by the owners We were sad to go as we enjoyed our stay. Would highly recommend!! A very enjoyable stay in the Oakcroft! Lovely spacieus immaculate cottage, up in a quite garden with many birds. Owners, Margaret and Rob the two childeren and dog, live next door and were so friendly and very welcoming. Everything you would want is in the cottage. We would HIGHLY recommend this cottage ! We have visit attractively English villages, like Longparish, Hungerford, Marlburough, Stockbridge and Highclere Castle and the nearby pubs like "The George" and "The Hare and Hounds" all are easy accessible by car. Definitely a 5 star spot! Janske B. and Joop vd L.